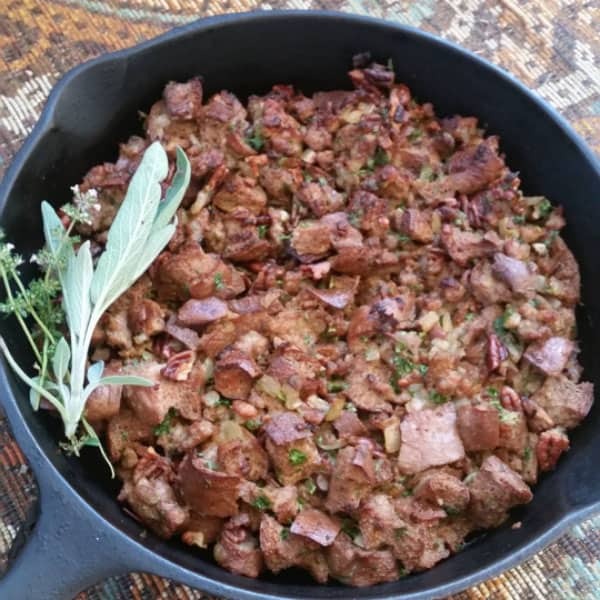 With Thanksgiving around the corner, I want to share this stuffing recipe with you. As the subject of stuffing comes up, it becomes very clear that it can become a very hot topic with many personal preferences, most often based on family traditions. That being said, this is more of a guideline than an exact formula. The most notable element is that “Yes, you can enjoy delicious stuffing (or dressing) at your holiday celebration, and keep to your way of eating.” Yay! No need to “carb out” or eat gluten or corn. Of course, you can easily have this as a side dish with all types of meals. 6-10 oz. raw sausage (7 oz. 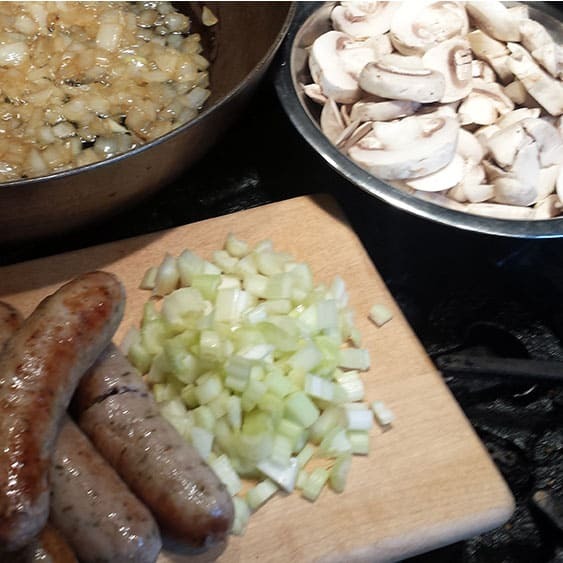 cooked) We like to use traditional country style loose breakfast sausage but feel free to use any sausage you like! The following ingredients are suggestions to personalize and add flavor and quantity to your stuffing. If sausage is raw, cook in a medium sized pan on stove top. If you’re using sausage without casing, break it up while it cooks. If using whole sausage, either remove from casing prior to cooking OR cut to pieces of desired size after it is cooked. 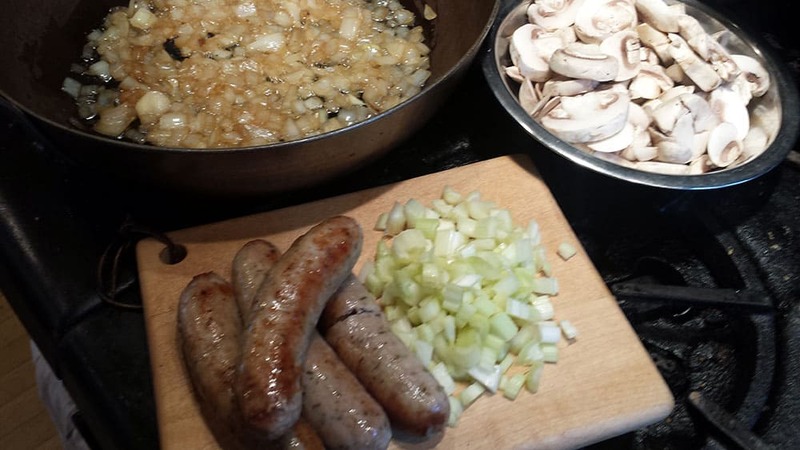 Remove sausage from pan and either drain or keep fat in pan, depending on your preferences. Add butter (or fat of choice) to the pan and saute onion and celery until soft. Add your mushrooms at this point if you choose to use them. Add poultry seasoning along with any other dried herbs you are useing at this point. Add 1 cup of stock and heat to a simmer, then add croutonz. Toss occasionally until croutonz have absorbed all of the liquid. Add sausage, nuts, and fresh herbs (if using). Taste and adjust seasoning adding salt and pepper as desired. Mix ¾ cup warm stock/bone broth with 1 egg in a separate bowl. Once well mixed, toss or fold into stuffing mixture. Transfer mixture into a 9 or 10 in. cast iron skillet or baking dish. Bake for approx. 15 minutes, or until stuffing is set. Leave in longer or turn up heat for the last few minutes if a darker crust is desired.